We appreciate your interest in our community service programs. Community Animal Network is a small organization that has grown to a size that is very difficult to manage without your help! Volunteering with with us gives you an opportunity to learn different parts of the rescue industry. We have many different areas you may choose to help with. We need a team of people to help local animals and volunteers giving time and their skills will make this happen! "It only takes one person to make a difference in an animals life!" 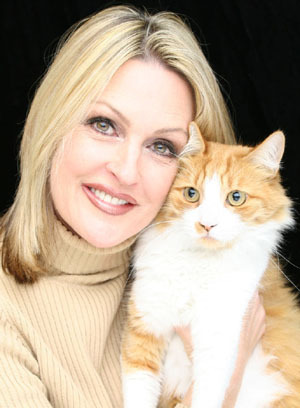 ABOUT THE FOUNDER: Community Animal Network was founded by DiAnna Pfaff-Martin in 1996 as a vet medical rescue for abandoned and local shelter animals needing to find new homes. She began negotiating with veterinarians to perform life-saving surgeries for the shelter animals of Newport Beach for a reduced fee and then promoted them for adoption by standing in public places with photos of the animals on poster boards and giving out the "Community Animal Report" which she wrote and published with the help of Office Depot and Staples. DiAnna now publishes an e-publication called the "Animal Report" focusing on "pets needing new homes" and "animals in crisis". She is often asked to speak with local service groups and has spoken with girl scout troops and the Newport Center Library lecture series. DiAnna conducts a "feline pet-parenting class" at Fashion Island for new pet parents on a regular basis. Animals are promoted from her web site www.animalnetwork.org and www.petfinder.com, www.1-800-save-a-pet.com and her "pets-in-public" showings where rescue animals and private parties both show their dogs and cats that need new homes. We have volunteer opportunities to fit the busiest of lifestyles! PLAY WITH KITTENS ALL DAY!! Volunteers needed to promote our kittens on the weekends at Fashion Island. 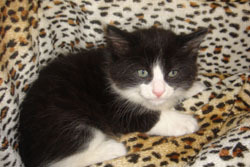 FOSTER ANIMALS IN YOUR HOME – Provide in-home care for abandoned cats/kittens and dogs. Large dogs need the most help as small dogs are the most sought after. Sadly, few people call to volunteer to help rescue the animals and bring them into their home. Foster parents and Bottle-Feeders Are Most Needed! BOTTLE FEED TINY BABY KITTENS – Rewarding round the clock and intensive care for tiny lives that would not be in this work without you. 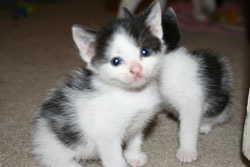 Foster parents and Bottle feeders Most Needed! VET RESCUE ASSISTANT: help with the in-taking of new arriving kittens and cats and booster vaccines for our animals awaiting adoption. We weigh, clean ears, trim nails, vaccinate, microchip, de-worm, de-flea s and booster vaccines or giving vaccinations to animals. WEB SITE HELP – Help add new animals for adoption and note adopted pets and change weekend adoption dates on Mondays or Tuesdays. This opportunity can could include the pet photography at Fashion Island on Saturdays. Seeking dependable and punctual animal lovers to volunteer to train for paid positions as pet adoptions operations manager. Duties: Open and Close the outdoor Saturday and Sunday weekend adoption events at Fashion Island 10 a.m. - 5:30 pm. Rain or Shine! The position consists of a lot of talking, information giving and decision making. The manager oversees minor and adult volunteers and the public to ensure that the common sense safely rules are followed. The day begins getting ready for the arriving animals and planning the cage placement for each animal based on its personality and color. The largest part of the day is spent interviewing prospective pet parents and guiding them to make the correct match for their family and lifestyle, as well as confirming our pet adoption rules and policies. The public tends to choose the tiny ones and this is NOT saving lives! Thus we need to manage kitten adoptions and “sell” the great qualities of adult cats and older kittens. A 30 minute feline pet-parenting class is given by the adoption manager to all pet parents at the time of adoption. Opening: Set up adoption station with info materials. Position the adoption podium and sun umbrellas. Review the cage crews set up and change if necessary considering safety. Plan the reserved cage space for arriving cats and the dog handler’s area. Greet the arriving feline caregivers and show their animals to their cages. Photograph new volunteers with the Polaroid and collect donations for the Tee shirts. Finalize adoptions by completing individual contracts and going over the animals individual health record and after give a pet parenting class to "all" adopting pet parents. Closing: Guide the minor child volunteers to help with closing work. Put adoption supplies away. Keep things organized and in their place. Cover our outdoor door cages with the tarp. Flexible Scheduling For WEEKDAY Afternoon OR Evening OFFICE HELP NEEDED, TOO! ADOPTION GREETERS - We take getting homes for the animals very seriously and we need people on the weekends that are personable and have the ability to talk about the great qualities of the adult animals in order to “sell” the concept of getting an older pet rather than a kitten. Kitten's bring the crowds and they all get adopted. Saving lives is about promoting the fine qualities of adult animals that need new homes. Prepare our adoption event for the arrival of animals at 12 noon for adoption. Greet the caregivers, confirm cage reservations and assign cages. Guide caregivers as to the protocol and safety for the adoption events. Mingle with the public to support the adoption team during our crowded and active adoption events. 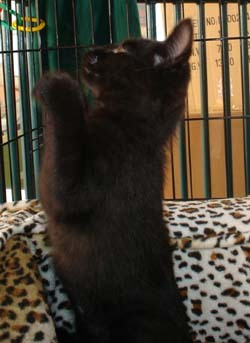 Guide would be-adopters to the management team to complete the paperwork necessary to take their cat home that day. Weekends 11am - 5:00pm. SCHOOL AGE VOLUNTEER COORDINATOR - From home, work with parents by phone and e-mail to sign up minors with parental approval to help at our weekend adoption events. We have a monthly volunteer orientation for all to attend prior to helping. Kids receive community service hours/school credit for their participation. Not for the faint-hearted. Train with the founder DiAnna Pfaff-Martin and then give your time from home. Using your home phone, retrieve our rescue phone lines voicemails three times a day. To avoid phone tag we provide you with one of the organization's cell phones to receive return calls. Learn the solutions and how to handle the calls from the Founder of the organization DiAnna Pfaff-Martin. FAX the phone logs and consult with DiAnna daily. E-mail information to the callers and follow up.